With Chromebooks gaining access to Android apps, these should be the first you grab from the Play Store. Ever since Google introduced Chrome OS on the CR-48 prototype laptop back in 2011, Chromebooks have relied on web apps and simple Chrome extensions to get things done. 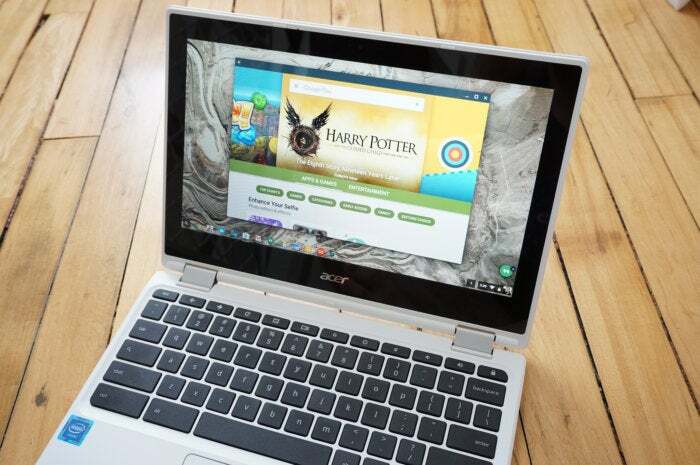 Now, Chromebooks are getting access to the Play Store with heaps of Android apps. Not all of them work well on Chromebooks, and others don't really add to the experience, but some of them can give your Chromebook a big boost. We tested dozens of popular apps on an Acer R11 to see which are which—here are the ones you should install on your Chromebook. 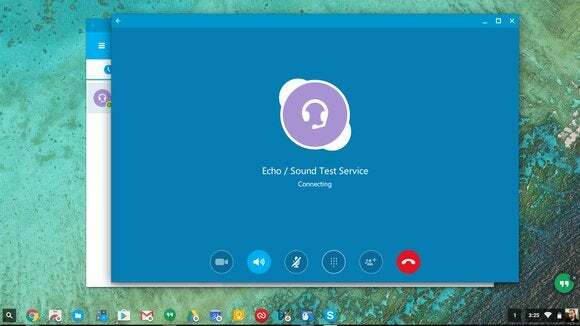 Hangouts has always worked on Chromebooks, but Skype has very limited functionality in the browser. Now, you can get this vastly more popular VoIP and video chat app on your Chromebook. The Android app runs in tablet mode, seems to understand the device hardware, and doesn't crash. The buttons can all be used with a mouse, and there are no gestures that would require a touchscreen. It's free to use, unless you need to buy Skype credits for landline calls. Chromebooks have very limited video playback options in what is basically a Chrome tab. It only works with a few video formats and the controls are basic. 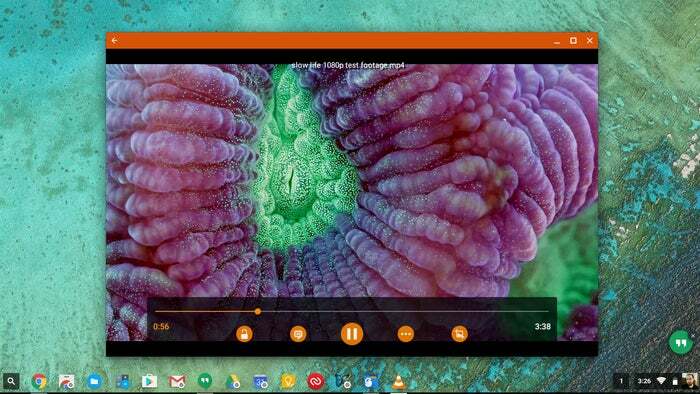 Installing VLC from the Play Store is a much more powerful way to watch video on your Chromebook. It supports almost any file type, has plenty of video options, and there are even gestures if you have a touchscreen Chromebook like the Acer R11 or Pixel. VLC will also play properly in the background if you more focus to a different app. Photo editing is rough on Chromebooks, and that's doubly true when you're talking about RAW files. There are only a few Chrome apps that attempt this, and none of them are very good. 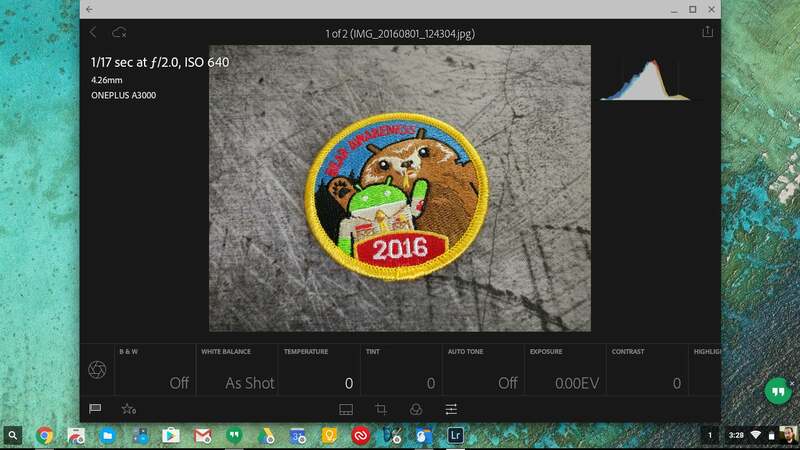 The Android version of Lightroom, however, works great on Chromebooks. It can pull images (RAW or JPEG) from your local storage or Adobe's cloud. The editing tools are much better than what's available natively on Chrome OS, and the buttons are fine for a mouse. There are a couple sliders that are a bit tedious with a mouse, but it's definitely usable without a touchscreen. If you are into Snapchat (all the kids seem to be these days) this is your chance to use the app on a computer rather than a phone. Snapchat installs and runs on Chrome OS, though the camera might be a little buggy. You can still message, view stories, and so on. 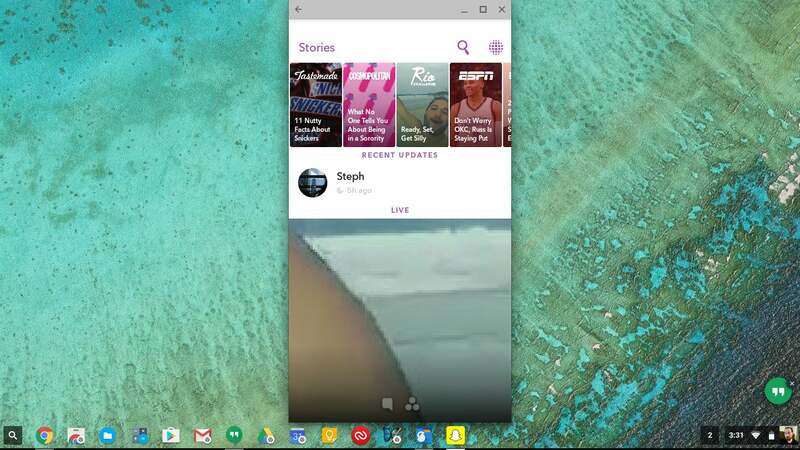 This app does use a lot of gestures, so it's better with a touchscreen Chromebook. It'll work alright with a mouse, though. Evernote is a very powerful note taking app with more features than Google's comparatively simple Keep client. With the Android app, you get a much better interface than Evernote's constantly changing and awkward website. The app is very well designed these days, and it runs in tablet mode on Chrome OS for easy pointing and clicking without a bunch of gestures. 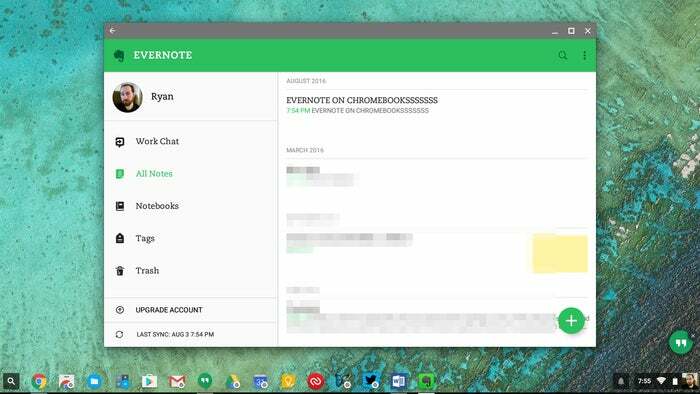 You can even share things in Chrome OS directly to Evernote and save them as notes. Be aware, Evernote recently changed its plans so you only get two active devices on a free account, and your Chromebook will count as one. 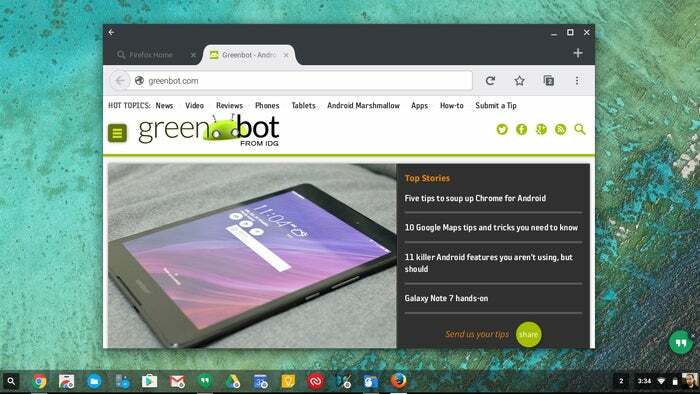 As you start adding more Android apps and games to your Chromebook, you're going to need to occasionally manage files like a real Android device. The built-in Chrome OS file manager is woefully inadequate. 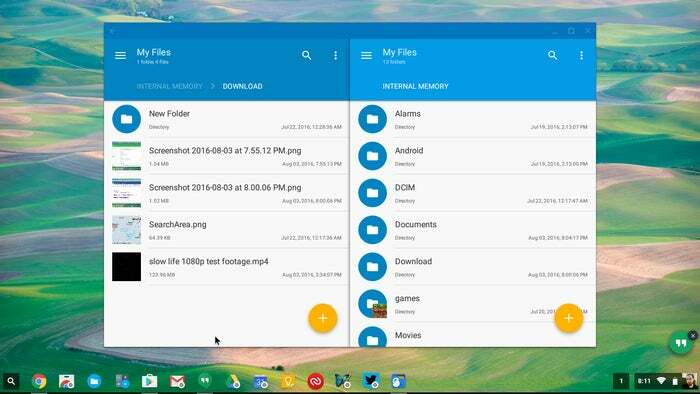 The best Android file manager I've ever come across is Solid Explorer, and it works wonderfully on Chrome OS. This app has a dual-pane interface for easy navigation, drag and drop functionality, creating/opening ZIPs, and fast indexed searches. It's easy to get around the interface with a mouse, and it's great for touchscreens as well. This app has a free week trial, and after that it's $1.99 to buy. Podcasts are available via various online services, but Pocket Casts that's a great way to pull all your subscriptions together and manage episodes. Now, you can use Pocket Casts on Chrome OS without paying for the $9 web version of Pocket Casts. The Android app runs great on Chrome OS and it plays audio in the background while you do other things. You manage playback from the notification just like on Android, which is neat. 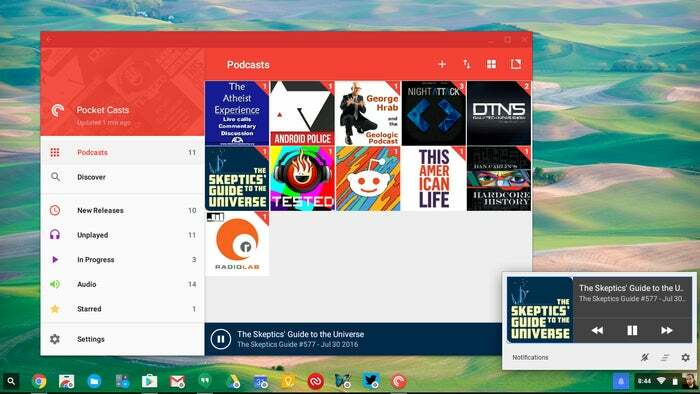 Pocket Casts costs $3.99, but you only have to pay for it once and it works on all your devices, Chromebook included. 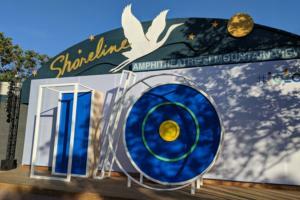 Microsoft launched Office apps on Android as its own mobile ambitions continued to falter. Word, Powerpoint, and Excel all have the same use case here—they let you work with Microsoft files on your Chromebook without an internet connection and without uploading them to Google Drive where the formatting will become garbled. These apps are designed for tablets, so they work fine on the big screen. 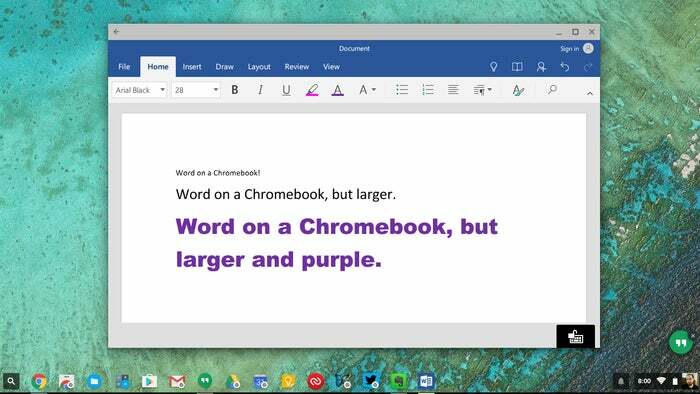 They work fine with the Chromebook's built-in keyboard too, making the mobile version of Office apps much more usable than they are on a touch-only device. The menus are a little more spacious to accommodate a touch interface, though. The Office suite is free for basic use, but some of the more powerful features require an Office 365 subscription. There are a few extensions for Chrome's anemic that can add multiple cloud storage providers in addition to the default Google Drive. They just aren't very good. Consider instead using the Android version of Unclouded. This app lets you plug in multiple cloud storage accounts including Dropbox, Drive, OneDrive, Mega, and Box. The app has a capable file browser for downloading and uploading files. It runs in tablet mode with big image previews and doesn't make heavy use of gestures. It works great with a mouse or a touchscreen. You can try it for free, but adding more than one cloud provider will require a $1.99 in-app purchase. 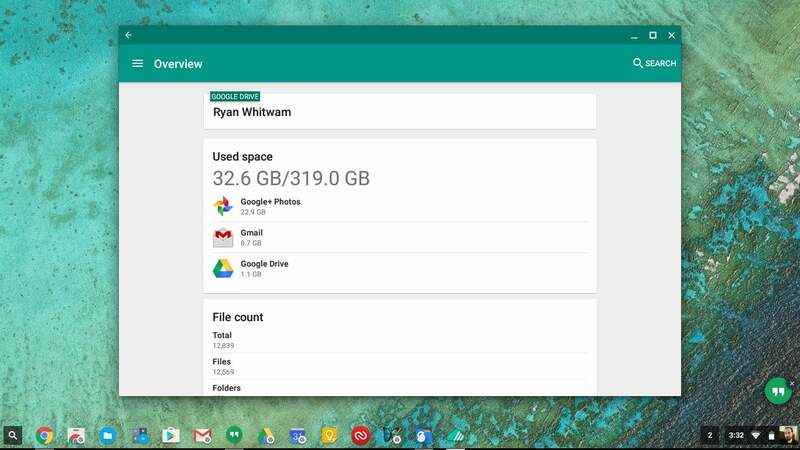 Chromebooks are supposed to run Chrome, but your options are expanded with Android apps. You can run Firefox on your Chromebook, and it's surprisingly capable. Plus, you get to feel like a rebel. Firefox has a tablet interface with a standard tab bar and navigation buttons, so it's easy to use on a Chromebook. If you use Firefox on other devices, it will sync your bookmarks and tabs too. It's prone to rendering mobile versions of web pages, but you can toggle on the desktop version in Firefox's settings.